Location: At the south-east end of Pontypool town centre. It was agreed that the new church was required in 1901, the foundation stone (not found) is recorded as having been laid in 1904, and the church was consecrated 16/03/1905. An Edwardian church in a mixed style aligned north-east/south-west with the entrance at the north-east, and built of grey rock faced limestone with freestone dressings and Welsh slate roofs. A large church with gable to street and with nave, aisles, choir, lobby and north-east tower. Entrance front has double plank doors with arched head and small flanking windows with pointed heads and dripmoulds. 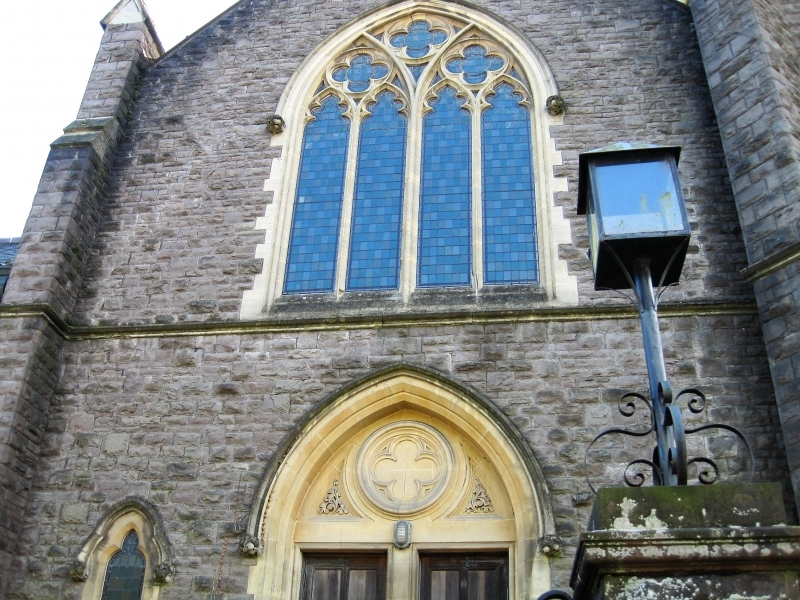 Above the doorway is a large four light Geometric window with three quatrefoils in the head, gable cross above. Cill band which runs also round the tower which stands forward. This has three stages with a pointed arch two light window on the ground stage, a small two light window with square head and cusped lights on the first stage and a tall pointed belfry louvre in the second stage, above this are battlements and corner pinnacles. The other faces of the tower are blind except for the belfry louvres which are on each face. Each long wall of the church has 5 two light windows with trefoil heads in the aisles, and in the clerestorey above. Projecting stair turret to the south-east corner which has a single light window facing the street and a two light one facing south above. Four light window over the altar similar to that on the entrance front. The interior has a five bay nave arcade with octagonal piers and sharply pointed arches. Tall hammerbeam roof which is ceiled with longitudinal boarding at collar level. Tall three centred cancel arch with hoodmould with carved stops. There is a west gallery with a panelled front and a lobby screen below, and all pews and fittings survive unaltered. All these are in Canadian oak. The Gothic style pulpit looks older than the rest of the fittings and may be reused. Chancel roof also ceiled and the east window has coloured glass commemmorating the benefacting family. Good organ by Vowles of London. An unaltered turn of the century nonconformist church which also plays a very important townscape role at the south end of Pontypool town centre. In Pontypool town centre in a row of listed buildings fronting the Italian Gardens. In Pontypool town centre in a row of listed buildings opposite the Italian Gardens. In Pontypool town centre next to St. James's Church. In Pontypool town centre next to the Town Hall. II Memorial gates, gate-piers and flanking quadrant screens to Pontypool Park. In Pontypool town centre opposite the Town Hall and immediately adjoining the Public Library. In the centre of Pontypool at the junction of Hanbury Road and Glentorvaen Road.